The truth may hurt us. It’s tough to swallow sometimes, but it’s better to deal with the truth and grow from it, than be comforted by a lie. Open your eyes. See things for what they are, as they are, instead of what you’d hoped. It may be painful. It may be difficult, but it’s the only way to move past what is. 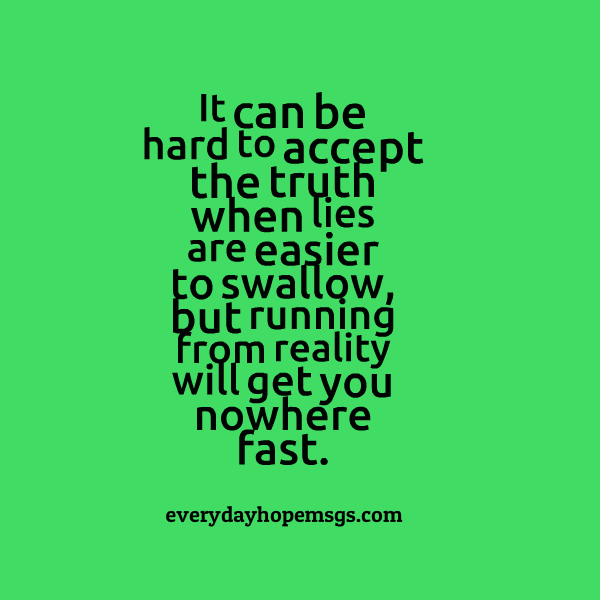 It can be hard to accept the truth when lies are easier to swallow, but running from reality will get you nowhere fast. Be strong. Life is too short to live anywhere but in truth. Your untapped potential, the life of your dreams, is contained within the truth, if you have the strength to face it. And you do. You have the strength to face whatever is here and whatever lies ahead.